Butter (or spray lightly with cooking spray) a 9″x13″ pan. In a large microwave safe bowl, place 3 tablespoons of butter (cut into a few pieces), and 4 cups of marshmallows. Microwave about 3 minutes (stirring after 2 minutes) watch the microwave, cooking times may vary. 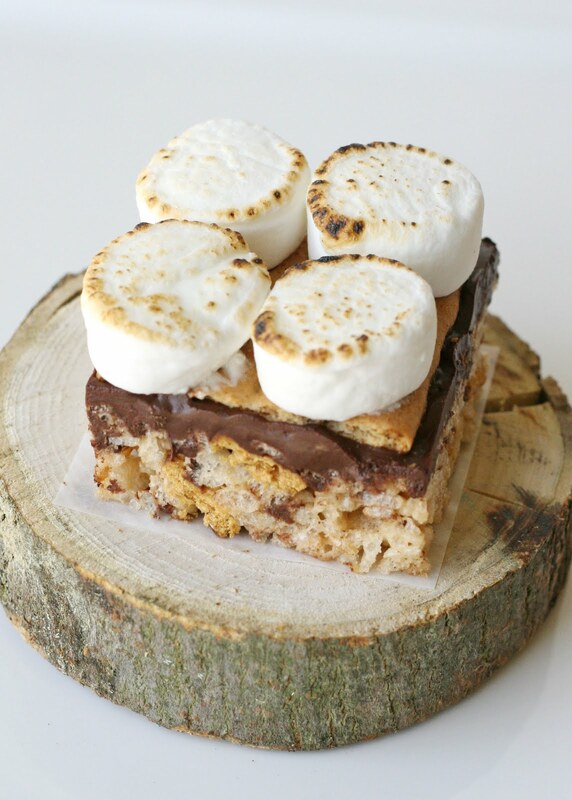 Cook in microwave until butter and marshmallows are melted. Stir gently. 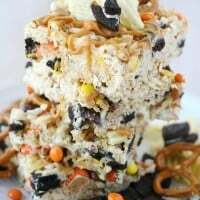 Add rice krispies and golden grahams cereal and stir to combine. (try using a plastic or silicone spatula sprayed with a bit of cooking spray). 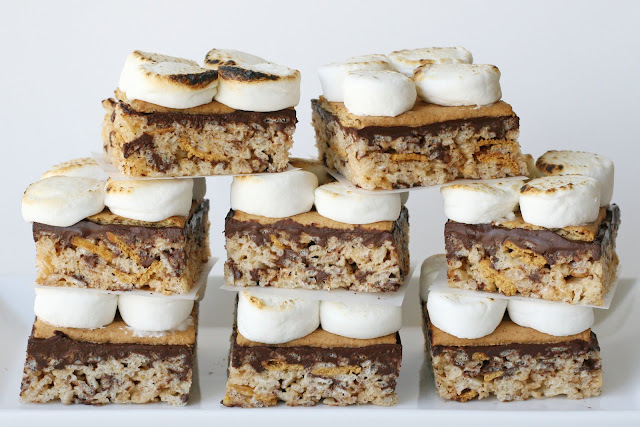 Add mini chocolate chips, stir quickly, and immediately pour mixture into prepared 9″x13″ pan. Press into pan (with spatula). 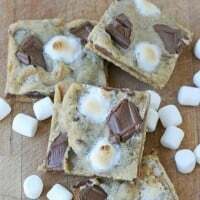 Melt semi-sweet chocolate (or chocolate chips) in a microwave (at 50% power), in 30 second intervals, stirring between intervals. Heat until just melted. 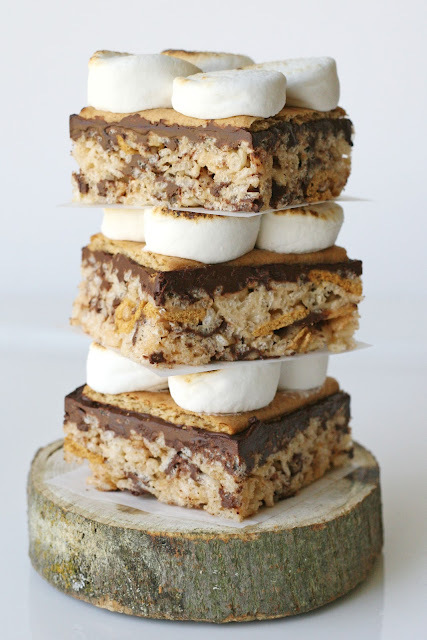 Spread chocolate on top of rice kripies treats in pan. 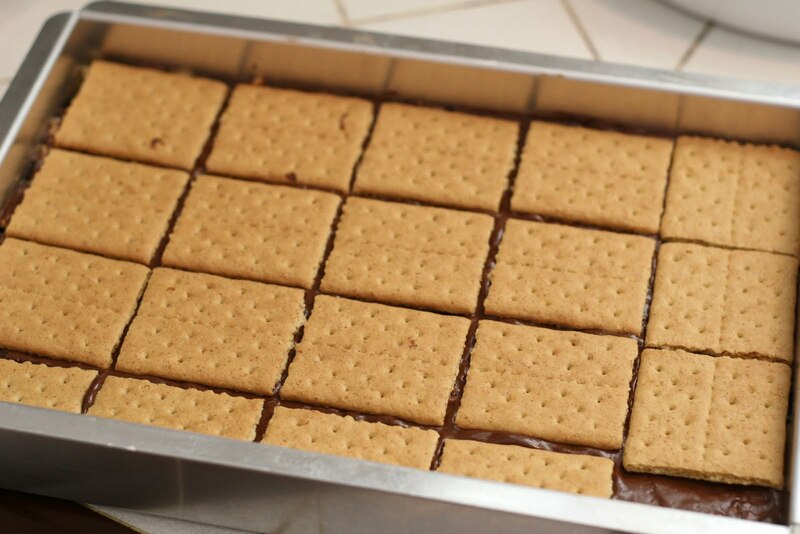 While the chocolate is still warm, lay graham cracker squares on top, leaving a tiny bit of space between each cracker (as shown below). 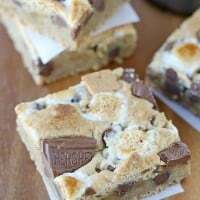 Put entire pan of “treats” in the fridge or freezer (or a cool location) until the chocolate has set (about 10-15 minutes). 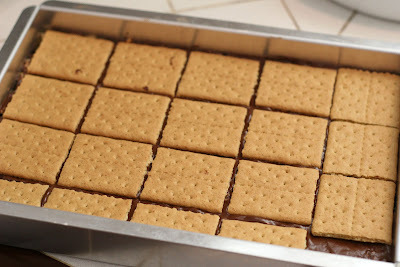 Cut into squares with a sharp knife, using the lines between the graham crackers as a guide. Place treats on a large baking sheet, separated slightly. 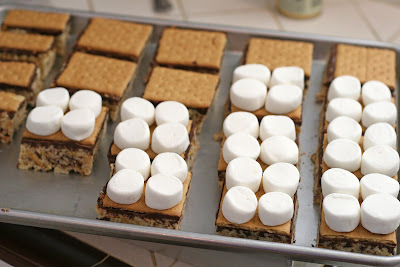 Cut large marshmallows in half, (just a couple at a time), and place cut side down onto graham crackers, (as shown below). 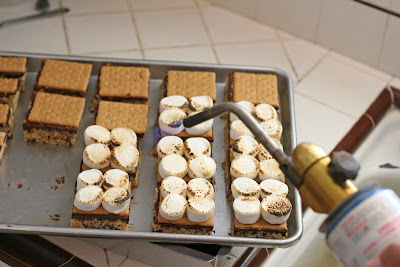 When all the graham crackers are topped with marshmallows (ignore my photo, I ran out of marshmallows), use a kitchen torch (or propane torch) to toast the marshmallow. If you don’t have a torch, this would be a fun reason to get one… OR, you can toast the marshmallows in the oven. Preheat your oven to broil. Place baking sheet of treats in the oven, leaving the oven door slightly ajar. Broil about 30 seconds, watch them, they can burn quickly! 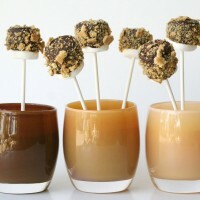 I’m adding these treats to Tidy Mom’s I’m Lovin’ It post. 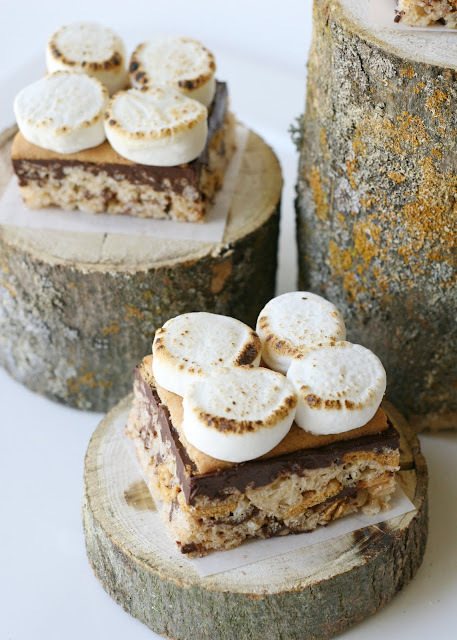 I am making these for a picnic this weekend!